This flower has trumpet like blooms that grow in a cluster up a hollo stalk. The flowers in the photo above haven’t opened yet and, with the right care, the blooms will last at least a week after they’re delivered. Hyacinth are available in a number of colors including purple, blue, pink, and white. the name is derived from the name of a beautiful Spartan youth, accidentally killed by Apollo, the sun god, while playing quoits; from his blood, sprang the beautiful flower- hyacinth. Whilst this flower is found in an assortment of hues, from the tragic tale of its name, the purple hyacinth stands as a symbol of sorrow, a request for forgiveness. According to another legend, the wind god Zephyr, out of jealousy, blew the discus to kill Hyacinth. From his blood sprang a flower, which was named for him. Hyacinthus grows from bulbs, each producing around four to six linear leaves and one to three spikes (racemes) of flowers. In the wild species, the flowers are widely spaced, with as few as two per raceme in H. litwinovii and typically six to eight in H. orientalis, which grows to a height of 15–20 cm (6–8 in).Cultivars of H. orientalis have much denser flower spikes and are generally more robust. The name “hyacinth” itself can be traced back to remote antiquity, a relict of a non-Greek language, sometimes called Thracopelasgian, spoken some 4,000 years ago. It is apparently connected with the blue color of water, indicating a reference to the true species, Hyacinthus orientalis, which possessed a blue flower, the plant later developing bud variations of white and pale mauve to deep mauve-purple. The parent of the present day garden or “Dutch” hyacinth was prevalent in ancient times as a wild flower in a number of areas of the eastern Mediterranean, through Asia Minor and Syria into Iran and Iraq. . . . The wild species that occurs . . . [from sea level] up to 2,000 meters is a delightful if delicate but generally very hardy plant which can reach up to 30 to 40 cm in height with a loosely spaced raceme of 2-15 very fragrant pale to mid-blue or rarely white flowers in April-May. Each is about 0.5-2.5cm long and bell, funnel or urn-shaped with the upper half of the perianth segments spreading out flat in a star-like form. The dainty multi-flowering Roman hyacinths which until quite recently were widely offered in white, pink, and blue for early Christmas bloom indoors were, indeed, derived from H. orientalis albulus and had nothing to do with the greenish-flowered H. romanus, now correctly Bellevalia romana. Roman hyacinths are, however, now very difficult to find for they have been superseded by a somewhat more showy multiflora or “Fairy” type. 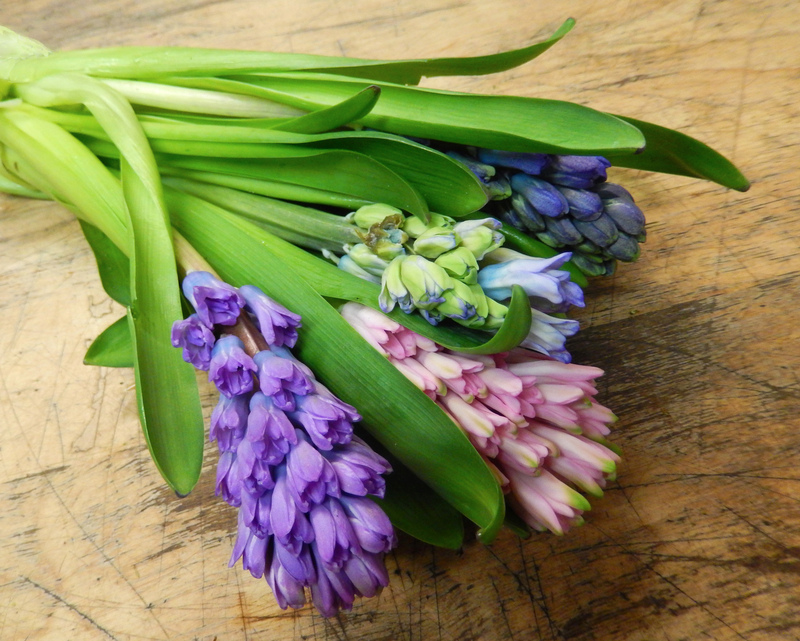 These were derived, initially, by George van Veld of Lisse, some 50 years ago by crossing Roman hyacinths with single garden varieties to obtain early flowering varieties with larger-scale flowers in a wider color range. . . . It was Hyacinthus orientalis which gave rise to the superb range of florists’ hyacinths or garden varieties through a lengthy process of selection and cross-breeding, no other species having been involved. The breeding history of the cultivated hyacinth goes back more than 400 years, all cultivars stemming from a single species and probably from only one or a few accessions of this species. Breeders selected for larger flower size and different flower color and were also influenced by fashion. Garden varieties have increased enormously in stature, becoming waxy, fat, and stout, but fortunately have retained the sweet scent if not much of the grace of the wild species. Double as distinct from single cultivars have enjoyed several periods of popularity, but in recent times breeding has tended to concentrate on single varieties to produce even more massive spikes and clearer and stronger colors.